DemoCurmudgeon: Walker targets workers in Chicago and elsewhere, bypassing hard hit Milwaukee, Racine and rest of State. Walker targets workers in Chicago and elsewhere, bypassing hard hit Milwaukee, Racine and rest of State. 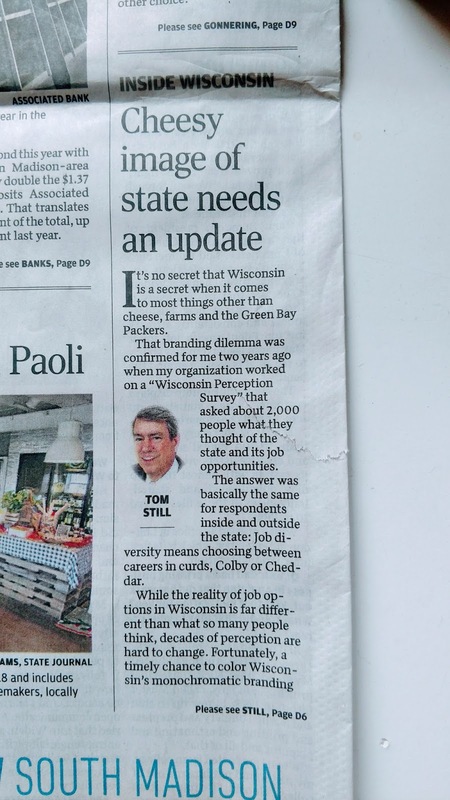 Scott Walker has washed his hands of every out of work Wisconsinite, giving up on them (too much work I guess) while seeking an outside labor force from Illinois. Wow, what an idea; take the easy way out after trashing public education, without ever lifting a figure to train, retrain, or coordinate employers with schools to encourage apprenticeship programs statewide. Oh, and with low unemployment, we're going to need an Illinois Foxconn workforce that bypasses the struggling Milwaukee/Racine jobless. Gov. Scott Walker’s announcement of a $6.8 million marketing and advertising campaign aimed at Midwestern millennials, returning military veterans and alumni of the state’s public and private colleges … promote the state’s industry mix, recreation, education, arts, health care. "Walker says German candy-maker Haribo was concerned about its ability to find workers for its planned Wisconsin gummy bear factory that will employ 400 people in Pleasant Prairie after news broke that Foxconn Technology Group was building a massive facility nearby. Walker met with company officials to calm their fears. Foxconn plans to employ between 3,000 and 13,000 workers 13 miles away in Mount Pleasant." It’s no secret that Wisconsin is a secret when it comes to most things other than cheese, farms and the Green Bay Packers. That branding dilemma…Job diversity means choosing between careers in curds, Colby or Cheddar. The combination of a looming worker deficit and the impending arrival of high-tech manufacturers such as Foxconn has created a moment in which Wisconsin must finally get serious about attracting more people and selling itself as a well-rounded place to live, work and play. WSJ: Despite a new report showing Wisconsin has the fastest-shrinking middle class in the U.S., the Gov. Scott Walker administration says the state is headed in the right direction. March 24, 2015: Wisconsin ranks worst among the 50 states in terms of a shrinking middle class, with real median household incomes here falling 14.7 percent since 2000, according to a new report. The Pew Charitable Trust report showed Wisconsin with the largest decline in the percentage of families considered "middle class." A declining population, particularly when residents are moving out of state, often can be traced to a lack of job opportunities or a low quality of life. Between 2010 and 2015, 14,210 more people moved out of the state than moved in, equivalent to a net population loss of 0.2% over that time. Wisconsin is one of just 14 states with a net negative migration over the last five years. Reach out to Millennials in Chicago and nearby on the theory that they’re reaching an age in which starting a family and leading a more balanced life is better than living in a tiny apartment and fighting rush-hour traffic. A point yet to be addressed is how to overcome a belief, which surfaced in the 2015 perception survey, that Wisconsin isn’t very tolerant. Part of persuading people to relocate is assuring them they won’t become strangers in a new land ... maybe this time the state will recognize it must cut a big block of cheese if it hopes to attract and retain tomorrow’s workers.